The Users report provides a list of all users and groups that have accessed XTAM, including metadata, IP, activity and permissions. User: Displays the name of the user or group. Type: Displays the type, either User or Group. Added: Displays the timestamp (MM/DD/YYYY HH:MM:SS) of when this was added to XTAM. Last Activity: Displays the timestamp (MM/DD/YYYY HH:MM:SS) of when the last action was performed by this user. Last IP: Displays the detected IP address of the user from where they last logged into XTAM. Groups: Displays the name of any Groups that this user is a member of. Global Roles: Displays the Global Role assigned to this user and how it was assigned, either directly or via Group membership. This column will be empty for user who have not been assigned a Global Role. Objects: Displays the total number of objects that this user has at least Viewer permissions to access. 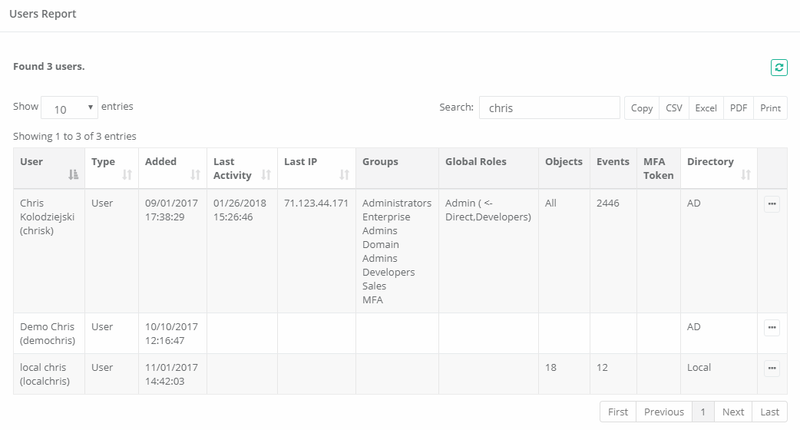 Events: Displays the total number of system audit events associated to this user. MFA Token: Displays the Google Authenticator MFA token assigned to this user. Directory: Displays the origin of the user, either AD if using Active Directory integration or Local if created as a Local User or Group in XTAM. AD Sync: Retrieves current First and Last name from Active Directory for this user. This option will only appear for Active Directory users. Reset Cache: If a user does not have access to any objects nor generated any events, then this option will remove them from this report. View Audit Log: Opens the System Audit Log report filtered to display only events for this user. View Objects: Opens the Inventory report filtered to display only objects this user has permissions to view.